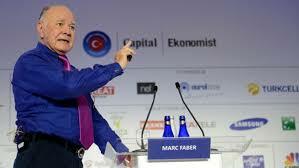 Marc Faber: Well, basically some people say that the central banks are out of bullets. This is not my impression. They can keep on printing money and boost asset prices where by not all asset prices will go up, some will go up and some will go down. But the point I want to make is the central banks are not really out of bullets. The economy, if it weakens some stocks will outperform others, in other words recently you’ve seen the weaker in automobile stocks, so there is still a selective process in the market. The stocks that have gone up the most recently are actually mostly companies with very little earnings, very high evaluations, Tesla, Amazon, Netflix and so forth and we’ll have to see.